The Conservatives have raised over $12 million in the first half of this year - their best result outside of an election year and almost twice what the Liberals have raised. The Conservatives have posted their best second-quarter fundraising results outside of an election year in their party's history, taking in just over $6 million in the three months ending on Jun. 30 and raising nearly twice as much money as the governing Liberals. According to the quarterly fundraising returns posted to Elections Canada's website, the Conservatives took in $6,045,466 from 40,908 individual contributions in the second quarter of 2018. The last time the party raised this much money in a second quarter was in 2015 — but never before has the party raised this much outside of an election year, when fundraising for all parties tends to increase significantly. 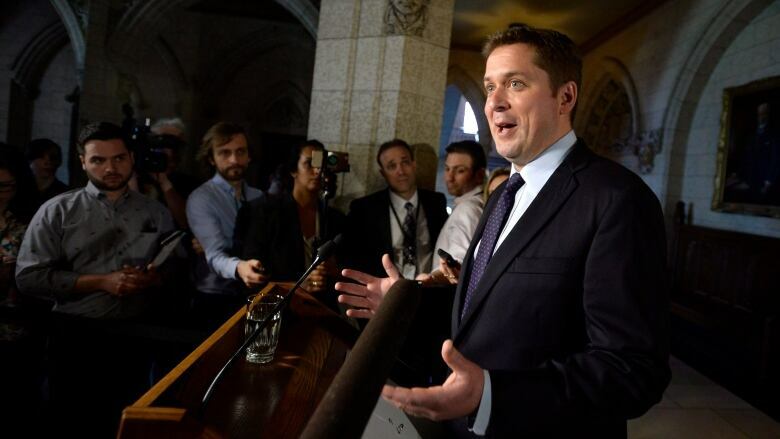 The numbers also show that the Conservatives have increased their total fundraising over three consecutive quarters, increasing their total raised so far in 2018 to $12.1 million — their best performance since the party raised $13.7 million over the first half of 2015, when the Conservatives were in government and gearing up for that fall's federal election. The Liberals raised $3,099,218 from 31,692 individual contributions in the second quarter, according to figures provided by the party. Although that is a marginal improvement over their performance in the second quarter of 2017, it's still lower than what the Liberals took in during their first second quarter as a government in 2016. So far, the Liberal party has raised $6.4 million this year, compared to $5.8 million in the first half of 2017. Between April and June of this year, the Conservatives raised nearly twice as much money as the Liberals. With the exception of the second quarter of 2015, when the Liberals were slipping in the polls before the federal election campaign began, the $2.9 million gap between the Conservatives and the Liberals is the widest since the 2011 federal election. The New Democrats raised $872,401 from 12,451 contributions. While that's better than the party's performance in the second quarter of 2017 — before Jagmeet Singh became leader in October — fundraising is still down about $500,000 from the first quarter of the year. The drop in fundraising between the first and second quarters of 2017 was just $83,000. In its worst second quarter result since 2012, the Bloc Québécois raised just $42,038 from 530 individual contributions — less than half of what the party raised in the second quarter of last year. The poor showing came in the midst of internal party turmoil culminating in the rejection by members of the leadership of Martine Ouellet and her resignation on June 11. The Bloc has not yet announced when a new leadership race will be held. The party's troubles have hit not only its bank account and standing in the House of Commons — half of its former caucus of 10 has split off as well. The last three polls show that the Bloc has between eight and 10 per cent support in Quebec — a historic low. The Greens raised $572,870 from 7,734 contributions, an increase from the first quarter of this year as well as the second of last year, but down from the party's second quarter showing in 2016. The filings show that some of the losing contestants for the NDP and Conservative Party leaderships in 2017 are still raising money to pay off campaign debts. Maxime Bernier raised $132,714 in the second quarter, adding to the $85,000 he raised in the first quarter of the year, while Kevin O'Leary took in $85,050, bringing his fundraising total for 2018 to just over $100,000. The businessman and television personality ended his abortive run for the Conservative leadership with about half a million dollars in debt. Also hat-in-hand to pay off campaign debts in the second quarter were NDP MPs Guy Caron (who raised $16,905 in the second quarter) and Niki Ashton ($1,180) and Conservative MPs Kellie Leitch ($11,972), Erin O'Toole ($7,552) and Deepak Obhrai ($10).